I tease my daughter and tell her she's Hippie 3G. First generation was my mother, who was the right age, grew up in California, and was absolutely a hippie, political type. The Amazing Turnip Girl is pretty proud of being the 3rd generation of our family to wear tie dye, march for Equality, sprout, garden, make things and hug trees. One of my hangups is that I love peace symbol jewelry, but flat out refuse to wear a mass produced one. So I make my own, out of wire, wood and paper sometimes. This one, crocheted from American cotton is the newest one in my collection. It works up fast, and only needs a very small amount of yarn and thread. Break off, weave in ends. 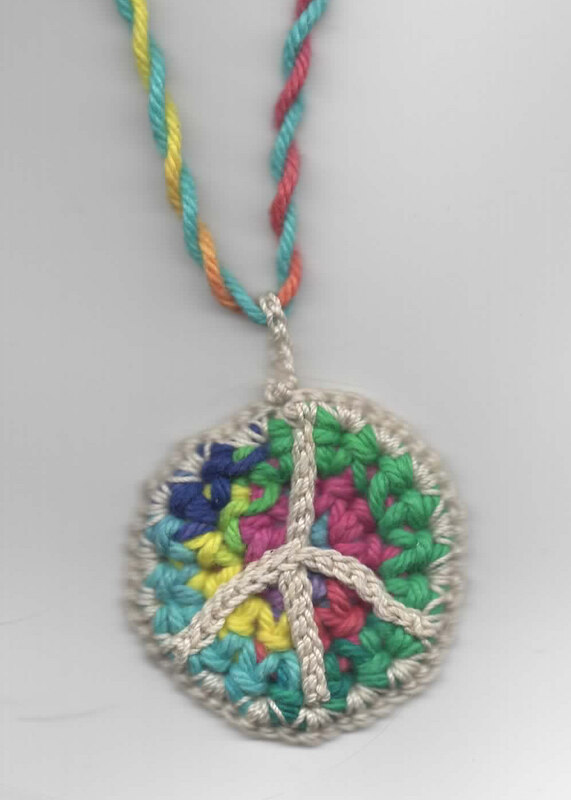 First you'll make an X shape, then it's attached to the yarn circle to make the peace symbol. Sl st up remaining 7 stitches. Remove hook leaving a loop open. Explaining this next part is going to look confusing. Refer to photo for help. Insert hook in top of yarn circle, pull thread loop through, ch 1 (does not count as first st) sc in same st of yarn circle AND top of thread X, sc in same stitch of yarn circle. 3 sc each in next 5 sts of yarn circle, 1 sc in next st of yarn circle, sc in same st of yarn circle AND end stitch of one side leg of the thread X, sc in same st of yarn circle, 3 sc in each of next 2 sts, Sc in next st of yarn circle, sc in same st of yarn circle AND the bottom st of the thread X, sc in same st of yarn of yarn circle, 3 sc each in next 2 sts, 1 sc in next st of yarn circle, sc in same st of yarn circle AND end stitch of second side leg of the thread X, sc in same st of yarn circle, 3 sc in each of next 5 sts on yarn circle, sc in next st, sl st to first sc to join. Chain 10, sl st to first chain to join. Bail made. Break off and weave in ends. Make a cord to hang it. I did a simple twisted cord for this one, but a chain would work just as well. Do you like hippie, groovy things? Check out my coloring book! It's full of mandalas with things like peace symbols, lava lamps and doves!